When I was younger, my grandparents would drive to Jekyll Island (on the coast of Georgia) to go fishing. They’d wake up before the crack of dawn, somehow get my smaller frame from the bed to the back of the car, and drive the forty-five minutes to the beach where we’d spend much of the day fishing and learning about various fish worth eating and not worth eating. So when I saw that there was a steampunk related comic called The Jekyll Island Chronicles… I had to reach out. How long have you been creating/working in comics? There are three of us in this endeavor and we all have been either reading or making comics since we were kids. I (Steve) used to sit in my room and draw my own versions of Spider-man and the Fantastic Four. Our actual jobs are all doing different things, so becoming graphic novel authors became a side hobby for us later in life. We actually started working on The Jekyll Island Chronicles in January of 2013. At what point did you sit down to become a writer/artist? Do you remember the first thing you drew/wrote? I think I am the one with the most graphic arts background. My dad worked in a factory during the day and would come home at night and paint portraits for friends and family members, to make extra spending money. He taught me how to draw when I was old enough to hold a pencil. I remember a book of Disney characters that I drew when I was a kid. I remember him sitting at the kitchen table with me and building dinosaur models. I have since graduated to more extensive and difficult kits, and scratch built a bunch of my own. Creating art has a wonderful, calming effect on me. 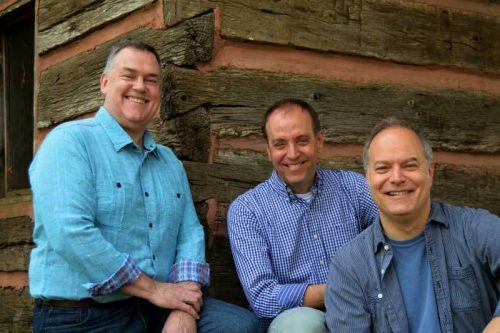 All three of us have been heavily involved in writing projects of our own in the past as well. Ed wrote another book several years back and Jack and I have been writing plays and sketch comedy for our church for many years. Who inspires you? Or do you have a favorite artist or creator? Jack loves experiences: he is a Disneyphile through and through. He would build a scale (and highly detailed) model of Disneyland in his house if he could. Ed is a voracious reader and plows through novels constantly. He loves sci/fi, mysteries, and westerns. And I get inspirations everywhere, no place in particular. Sometimes, I just like to walk through a retail shopping center and look for things that inspire me. How do you manage your daily/family life with your creative work? Is this your 9 to 5 or is this your 10 to 2? Hah! We all have really demanding jobs. This is our hobby. Nights, weekends, while watching tv or sports at night. I am usually sitting drawing thumbnails on my ipad to make life easier for our artists. We try to meet periodically to line up on story and plot development (maybe once or twice a month). We tell our spouses we don’t play golf (at least not well), so this is our club membership. It’s often difficult to get word out about independent/small press comics. What do you do to market and promote your books? Anything work really well or really poorly? It’s been an eye-opening experience. I have an author friend at work who told me that marketing of books has changed over the years—authors are really much more responsible for this and publishers are, well, publishers. I have found this to be generally true. Not bad. Just generally true. Our publisher at Top Shelf, Chris Staros, told us pretty much the same thing after we signed our book deal. They publish the books, invite us to the Cons where they are present, put the books out in the proper channels, but we do the heavy lifting on the marketing (Facebook & websites, blogging, boosting posts, local book signings, reaching out to newspapers and magazines, etc etc etc). We had to learn how to do a bunch of stuff, from a literary marketing standpoint, that we have never done before. But Chris is a great sounding board for us and happily answers any questions we have. It’s so good to have his knowledge and experience base in our corner when we need it (which is A LOT!) We are working with a PR firm on putting together proposals for the release of Book Two. So, we are hoping to have more firepower in that area. What’s your process look like when you’re writing? Do you go with the full outline? Or are you a fly by the seat of your pants type? We have to have an outline. We use the classic three-act story structure, but because we are a series, we have to layer that structure over each book as well as the entire series. I guess that’s why trilogies make sense. For Book One, I had a lot of the basic story arc in my head, and Jack and Ed helped me fill in a bunch–like the whole Jekyll Island connection. Book Two was more of a blank page than Book One, so it was harder. We use note cards with plot points and move things around constantly in the beginning. When we get the arc locked down, we divide and conquer the writing duties, usually giving one person an act to tackle. We come back, read together, edit together, and make suggestions. The key is to hold your writing loosely. You can’t be so dogmatic to “have it your way”. If that happens, you frustrate everyone and it flies in the face of collaboration and making each other better. We are long-time friends, so that makes it easier. But even then, every once in a while, we have to work through things. It really is a lot of give and take. I currently live just north of Atlanta, in Suwanee, Georgia, but I’ve been to Jekyll Island dozens of times when I was younger. So it was very cool to even see that this book existed. What inspired you to create Jekyll Island Chronicles? Ed was instrumental in coming up with the idea to place much of the story at Jekyll. When I explained the original idea to him, he asked if I had ever been to Jekyll. I had been in Atlanta for 25 years and had never gone there, and only just heard of it but never really knew about its history. So, my wife and I took a weekend, went to down to the island, toured it and my brain exploded. It was the PERFECT set up for the characters and the scenarios, which were all post-WWI and at the height of the gilded age at Jekyll. It is a Georgia treasure and our hope is that people, especially Georgians, will become a little more knowledgeable about their own history. What’s been the reaction to the book? It’s been extremely positive. Of course, our family and friends have been our biggest cheerleaders. We’ve gotten good reviews on Amazon (especially) and Good Reads. Every once in a while we get someone who “doesn’t get it” or takes issue with the alt history portions of it. We even had one guy who reviewed it and got the plot/character points wrong, so did he even read it?? But then again we were named one of the Top 10 Books Every Young Georgian Should Read for 2017 (all graphic novels go in that category)—so that was a nice feather in our cap. We already had a second printing. We had a line of people waiting to sign the book at the NY Comic Con, so that was pretty cool. We’ve gotten a lot of interest from podcasters, bloggers and people wanting to do interviews. This is our first rodeo, but so far, so good. Are there themes and/or subjects you find yourself drawn to again and again in your work? We started this whole process with themes. We wrote down the things/principles we believed and wanted to be true for our story. First, we saw a lot of cynicism with heroes—dark heroes, conflicted heroes—and we wanted to do something different. Maybe even classic. My grandfather fought in the US Cavalry in WWI to gain his citizenship. He was a regular, simple man of principle. He knew right from wrong. He wasn’t perfect, but he wasn’t constantly dark and conflicted. We wanted a return to classic heroism. We wanted people who were willing to work together in spite of their differences. Our country is torn down the middle today and we are all saddened and sick of it. At least we have a built a world where people can come together for the greater good. Also, we wanted to have a world where it wasn’t evil to have resources. Andrew Carnegie gave away like $300 million dollars. He built a system of libraries all across the country. Not all people with wealth are robber barons, you know? Jack and I worked for one for decades. There is good and evil is ALL people–not just one group, one type, or one party. We hoped that the book would force people to actually look for the good in all of our heroes. Finally, we wanted a story where the veterans were the biggest heroes. We owe SO MUCH to them. It’s no surprise that our original heroes are the broken WWI vets that get “rebuilt” to fight the atrocities of the early 20th century anarchists. Your first graphic novel was released by Top Shelf & IDW Publishing. How did that relationship come about? We actually sponsored a class at SCAD in Savannah to help us create a pitch packet for publishers/production companies that might be interested in our idea. Once we got the packet done, we approached Chris Staros with Top Shelf. He was Georgia-based, actually Marietta-based, which was right around the corner from all of us. We called him, took him to lunch one day, introduced ourselves, and handed him the pitch packet. He said he would take a look at it and give us comments. The next day he called me and said he thought it was good—really good—and if we finished it, he would like to keep the whole thing in Georgia and publish for us. WOW. I know that this is NOT how it is supposed to work. But, it happened for us and we were, and still are, very grateful to Chris and his confidence. When Top Shelf got acquired by IDW, that confidence transferred over to them. They have been huge supporters of ours and they now have us in their catalog that they send to production companies for tv/film. You currently have 1 graphic novel out there with a second one due out next year. 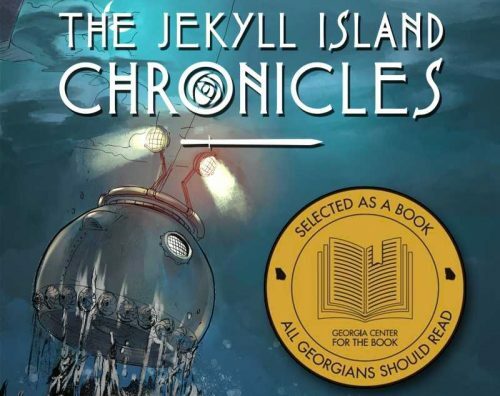 What’s the overall plan with Jekyll Island Chronicles? The plan is to keep making books until we get too tired and stop (or someone tells us to stop). At least we want 3. But the larger goal is 6. The story arc of the original Jekyll Island Club ends in WWII. We would love to take it that far. I see on your website that there are teaching materials based on the comic. Can you talk a little about how you came to that idea as well as your goals with the program? Well, the story has a TON of facts in it. The alt history component actually has a lot of HISTORY. We always loved the idea of using the book to teach history and have students weave through the narrative of what is true and what is not. So we approached Glen Downey (an author who is an expert in this area) and he agreed to put together teaching materials for us. They are all available for free on our website. We have a public high school in the Jekyll area that is using it in both the US and world history class, and a private school here in Cobb County that is doing the same thing. Ideally, this is a great way for creative teachers to introduce their students not just to history but also to the medium of the graphic novel. We think this is a big idea. Comics is an amazing collaborative medium. Tell me a little about the artists on the books. We met both of our artists in our SCAD class. They were students who, at the time, were finishing up their studies. Moses Nester is our illustrator/inker and SJ Miller is our colorist. One is in ATL and one is in Vegas. Everything is done digitally. I take the script, gather reference photos, drop them into an app for my ipad called Strip Designer and create tight comps/thumbnails, send them electronically to Moses who inks, sends to SJ for coloring and sound effects and then back to me for final approval. It seems to work pretty well. Our artists are very gifted individuals with a bright career in front of them! We are just so happy that we have access to them at this time of their lives—and we hope this is given them so good experience to bounce off of for the future. If you could go back in time ten years, what advice might you have for your younger self? Something you wish you knew? I wish I knew that I was really responsible for my creative outlets in life. I mean, I have always been creative, but sometimes at work, I was waiting for that itch to be scratched there. And at times, that didn’t happen. I wish I had been more aware of the idea to create instead of consume, and now I hope that our creative endeavor helps others to do the same. Bottom line, if opportunity doesn’t knock, build a door (with credit to Milton Berle for that fine axiom). 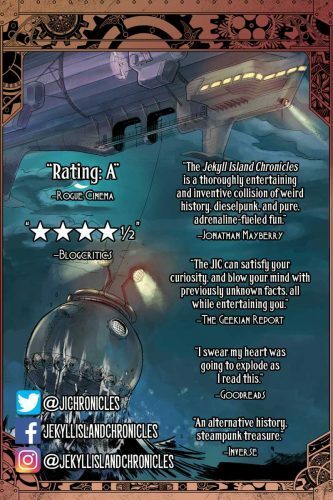 Where’s the best place to find out more about Jekyll Island Chronicles and the rest of your works? 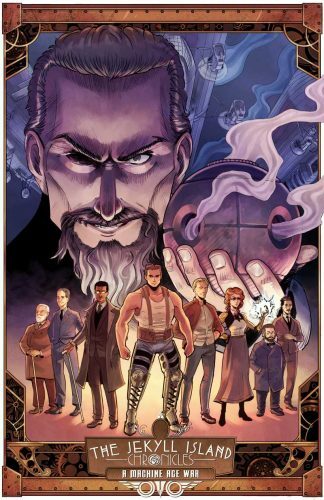 Steampunkers are welcome to check out our website, where we have a link for selling the book, pre-ordering book two and buying other merch. And the book is available in bookstores and on line everywhere. STEVE NEDVIDEK has worked in film, radio, and television and received his Masters Degree in Theater from Wake Forest University, where he completed his thesis in make-up design. He is an avid cartoonist, model maker, writer, and movie watcher, and resides in the Atlanta suburbs with his wife, kids, and dog. ED CROWELL holds advanced degrees in political science and international affairs. He is an executive at a non-profit and a writer with dozens of published articles. A lifelong fan of science fiction and fantasy, he and his wife have two children who went off to college, but left Ed and Cynthia with two cats, a fish, and a dog. JACK LOWE is a student of film making and themed entertainment. A passionate storyteller with a bent toward immersive, multi-sensory experiences, Jack and his wife, three children, two dogs, and two cats live in the shadow of Kennesaw Mountain in Atlanta. I want to thank Steve for taking the time to answer my questions! John McGuire is the creator/author of the steampunk comic The Gilded Age. Want to read the first issue for free? Click here! Already read it and eager for more? Click here to join John’s mailing list. His prose appears in The Dark That Follows, Theft & Therapy, There’s Something About Mac, Hollow Empire, Beyond the Gate, and Machina Obscurum – A Collection of Small Shadows. He can also be found at www.johnrmcguire.com. Press Release: John Carter of Mars Month - New video & blog content including a live roleplay stream of the John Carter of Mars RPG.